Let’s Make Some Noise for the ‘grizzlies’. “grizzlies.”, a student band, tries to establish a connection through their music with audience. 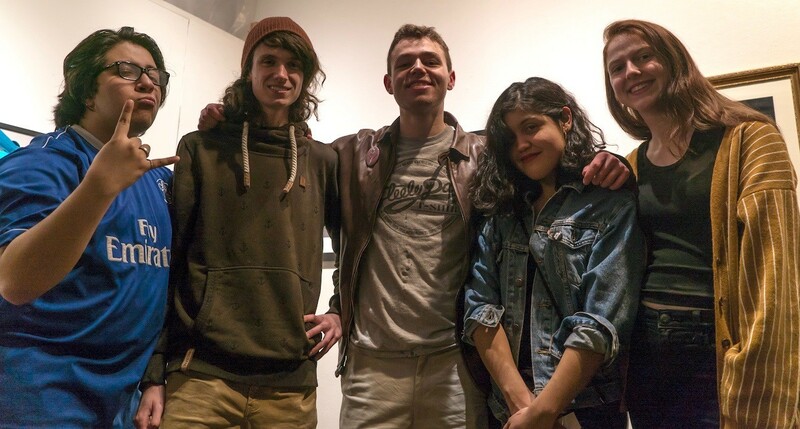 The student band “grizzlies.” is trying to make a name for themselves in the Rhode Island community, by constantly working together to create new songs and create connections with their audience. The “grizzlies.” was formed in 2016 when the members met in Musicians Guild, a club for any musicians to join and meet others with the same passion. Each member of the band has their own love for music and they each bring their own different perspective. When they all first met, it was evident to them that there was an immediate connection. 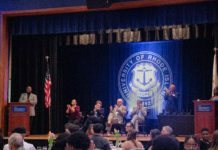 From there, both Zenil and Cynthia Munrayos, senior at URI, were able to find others who fit their style which led to Mike Villani, Harrison Dolan and Emily Iwuc joining the band. With Munrayos being the singer, Zenil playing the guitar, Dolan playing the drums, Iwuc on the keyboard and Villani playing the bass, the band was complete and they easily found their rhythm together. Along with their set rhythm, they were able to immediately decide the genre of music they would perform. “A lot of the labels that we have given ourselves are funky alternative or a rhythm and blues type of flow,” Munrayos. Along with naming themselves a funky alternative band, Zenil claimed that they also are somewhat of a soul band. With all of these different types of vibes, the band writes and covers a whole variety of songs, in order to make a connection with their whole audience. “I think a lot of the times we want to play a song that the audience knows as a way that they can participate,” Munrayos said. With the band constantly attempting to gain more of a fan base and make a name for themselves, inclusivity within the band is very important to them. Along with working harder in order to grow as a band more, they attempt to spread themselves around the community to introduce their music to new people. Their different venues all give them unique performances depending on the scenery. “We have all had our favorite shows. It all depends on how well we play and how the crowd responds,” Dolan, a junior at URI, said. After speaking to each band member, it is evident that their audience is one of the most important things to them. The way the band plays is very dependent on how their audience is reacting to their music and influences them heavily. With the hopes of a bigger fanbase, the band wants to grow together in the last few months before some of the members graduate from URI. Each band member agrees that they have made substantial improvements from the beginning and hope to do the same in the future. The band is a very tight-knit group that has grown closer over the years of performing together. Each band member loves the energy the crowd gives at each performance and allows the band to connect on a different level. The members really want to express their passion for music and being together. “My favorite thing is getting to make music with my people and sharing it with others, the unique moment that everyone in the room gets to share together that can never be replicated,” Iwuc, a sophomore at URI, said. “grizzlies.” new album, ‘Hibernation,’ was just released on Feb. 7 and can be found on their Instagram page @grizzlies.ri.